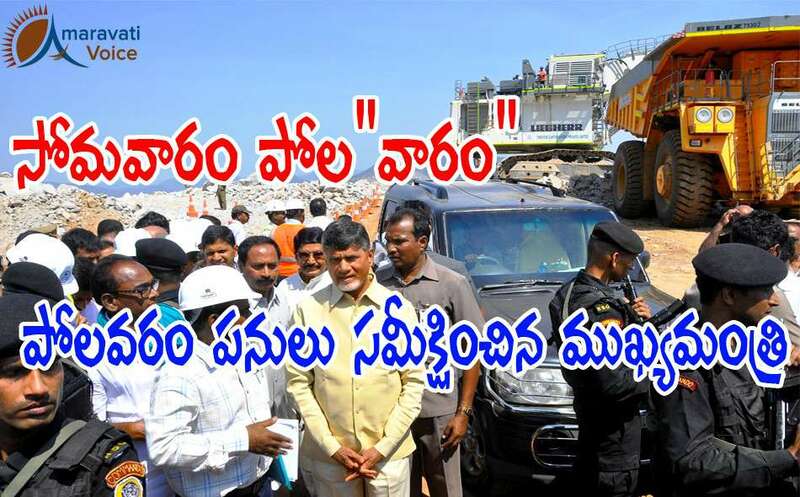 Chief Minister N Chandrababu Naidu has visited Polavaram Project site at Ramayyapetain Polavaram mandal on Monday. The Chief Minister reached Polavaram on Monday and inspected the Polavaram Irrigation Project site at Ramayyapeta village and reviewed the ongoing Works. Chief Minister also conducted aerial suvery over the project site. Chief Minister also has held a review meeting at the contract agency office. In View of the Chief Minister's tour to Polavaram area, the Superintendent of Police Bhaskar Bhushan and other higher officials already visited the site area and reviewed the security arrangements. The police party searched the forest area, as it is nearer to the extremists-prone Chhattisgarh and Khammam districts. Meanwhile, following the Chief Minister's tour to the Polavaram, the contract agency increased the pace of Works.